Another Bohol iconic tourist-service company catches international attention when a famous travel service website cited it for excellence in 2013. In 2012, travel ratings website www.tripadvisor.com cited Gerarda’s in Tagbilaran City as a highly rated eat-out restaurant for local and foreign tourists. 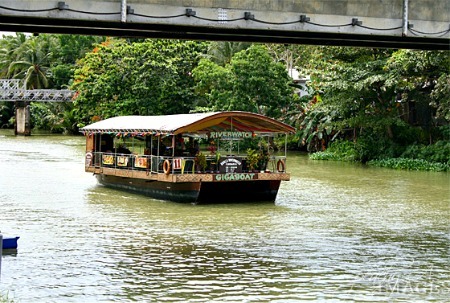 This year, tripadvisor confers to Loboc RiverWatch Floating Restaurant a Certificate of Excellence in 2013, for the company’s being among the top performing 10% of all businesses worldwide on tripadvisor. The citation, according to tripadvisor is given to businesses that consistently earn high ratings. TripAdvisor.com assists customers by providing access to relevant information to travelers who may walk into an entirely new place. The website posts travelers reviews and opinions of sites, transport, destinations, billeting, and other services using travel-related content while opening up an interactive travel forum on their site. In Bohol, RiverWatch Resto has slowly carved a niche of its own as a tourist service and destination which any tourist must experience, says tour transport driver Vincent Rey Rasonabe. What is particularly nice with the RiverWatch is its buffet spread which features the best of Bohol, boasts another tour driver who never brings his guests to other floating restaurants. A travel writer Stephanie F of Wuxi China said “This is a lovely activity to take part in while in Bohol. Each boat has a buffet with plenty of food and the whole operation of the boats moving around the dock and being restocked by smaller crafts is a site all of its own. For Tessie Labunog-Sumampong, owner of the restaurant, it is all about teamwork plus hard-work plus good service. “Hardwork...dedication and teamwork are our main ingredients seasoned with love and passion”, she said.